As the name implies, the Montecristo Dark No. 444 is a box-pressed beauty from the world’s most famous cigar brand. A dark and very oily Connecticut wrapper covers select Dominican filler leaf resulting in a tasty smoke with notes of sweet coffee, cedar, and intricate spices. The dark No. 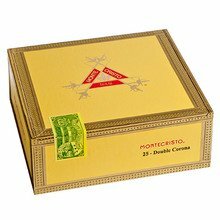 444 is sold in the classic yellow Montecristo dress box housing 20 cigars. You can never go wrong with a good Montecito. The number 44 is no exception. A good, dark smoke with all of the flat or you would expect. 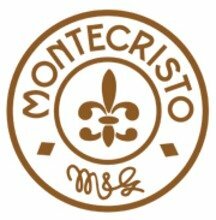 I tend to think that most Montecristo cigras are overpriced and do no provide great value for the price. I can find a much better cigar for $2-4 less than. 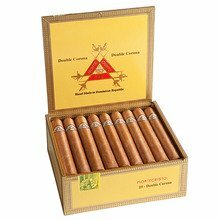 most Montecristo cigars. Having said all that I really enjoy the Dark 444, I try to keep a box always on hand in case I want a cigar and do not have a lot of time. It has excellent flavor for a small cigar without becoming too peppery or harsh at the end. I generally do not like box pressed cigars which tend to be too loose or too tight and burn too fast or canoe horribly. But the construction here is excellent.. This is my third box in the last six months are so and have yet to be disappointed..
Montecristo has an excellent name but sometimes their recipes are just so-so. This little guy looks like it will be very tasty- the wrapper is super. Sadly it is well on the mild side and when they combine a tiny cigar with a mild recipe they end up with something that is not worth the price. And it is still square. this is a full, and rich smoke. I person love a box pressed cigar. this has to be one of my favorite cigar. the box press gives you good cool smoke all the way through the smoke. even if you smoke it all the way down you get the same quality smoke. it is truly the best. I have yet to find a Monte that I didn’t like. That certainly don’t change with the 444. With its deep flavor and it’s slow burning prepare for a good hour long smoke! Another great cigar from montecristo. I'm always looking for the deals and this is one that I would buy again. It was a tough draw actually had to use a draw poker. The flavor was great and consistent. Full bodied smoke not for the timid. Loved the smell and draw. Seemed to be constructed well. I’m a new smoker so it was a little much for me. Once I smoke a little more I did add it to my favorites. I may be biased as I prefer a natural or darker, but these are easily one of my new go-tos. I have smoked many cigars from the hype to the classic. abosulutly magnificent. This cigar has all the mud body flavours you could ask for and finishes strong for such a mild cigar. I purchased some when it first came out and recently added to my collection. I will put this 8 dollar cigar in the same group as the pradrom, cohibia and Opus x lost city or Alec bradly fine and rare. This is an amazing cigar at any price and unbelievable at the price it’s offered. Great cigar. Consistent draw....like a Montecristo...overall great cigar! Will definitely purchase again. Delicious Montecristo. Thouroughly enjoyed this one. Semi sweet flavor. Great cigar to relax with. Recommend.